In a society where the pressure is on to look young and refreshed, it isn’t surprising that plastic surgery continues to increase in popularity. According to the American Society for Aesthetic Plastic Surgery statistics, more than 15 billion dollars were spent on plastic surgery in 2016. People want to improve their appearance, and plastic surgery is often one of their only options to achieve their goals. There are many innovations in plastic surgery. Patients can undergo a procedure that is designed to meet their individual preferences and unique anatomy. Breast size and shape: The breasts are a symbol of femininity. Women who are unhappy with the shape or size of their breasts can achieve their goals through plastic surgery. Breast augmentation is one of the most popular procedures requested by women, and more than 300,000 breast augmentations were performed last year. Facial fine lines and wrinkles: Signs of aging are inevitable. Many women are concerned about facial fine lines and wrinkles that are unresponsive to a healthy lifestyle and at-home treatments. Eyelid surgery was one of the top surgical procedures for women that can help to correct aging eyes. Injectables such as BOTOX® Cosmetic remain popular non-surgical options due to their short downtimes and ability to produce quick results. Protruding abdomen and weak abdominal muscles: Pregnancy puts a toll on the body. After childbirth, many women are left with excess fat, tissue, and skin in the abdomen and loose abdominal muscles. Tummy tuck surgery is performed on hundreds of thousands of women each year. Enlarged male breasts: Gynecomastia is a term that refers to excess glandular tissue on men that causes the appearance of female-like breasts. Many men are insecure when they have enlarged breasts, making them uncomfortable whether they have clothing on or not. Male breast reduction was one of the top procedures performed in 2016 and continues to grow in popularity. There has been an 181 percent increase in male breast reductions since the ASAPS survey taken in 1997. Sagging and drooping facial skin: Women are not the only ones concerned about facial aging. 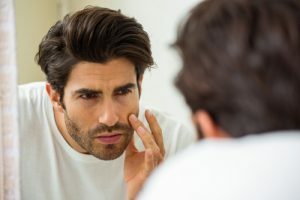 Many men find that as the skin elasticity weakens, they start to develop sagging skin in the face. Eyelid surgery and facelift surgery made up the majority of the plastic surgeries performed for men. Also, men often opt for non-surgical treatments such as facial injectables. Nose size and shape: The nose is a central feature of the face; therefore, it can affect the entire facial appearance. Some men naturally have crooked noses, wide nostrils, or large noses, or their noses may have changed due to injury. Rhinoplasty, or nose surgery, can be performed to modify the size or shape of the nose. If you are interested in learning more about plastic surgery and what options are available to you, Dr. Dubrow is a board-certified plastic surgeon who is highly skilled and experienced in surgical and non-surgical procedures. He is also a well-known revision plastic surgeon who has helped many patients reverse botched results. Schedule your consultation by calling us at (949) 515-4111 or by filling out our online contact form.